Here is my third and last June assignment for Craft Warehouse. It actually took about a week for me to make this card. LOL! I am not much of a card person. I leave that for my sister Becca. 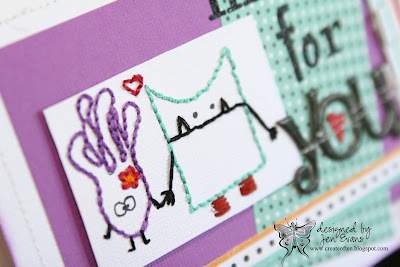 But, I really wanted to stitch these Little Monsters from Daisy Bucket Designs. Unfortunately, the first time I stamped the monsters I did one upside down without realizing it until I finished one and began the next! LOL! Anyway, in the end, it turned out exactly how I wanted it to. I actually began this project with the stitching and not sketching the design until I was finished. For this project my card turned out exactly like the sketch. 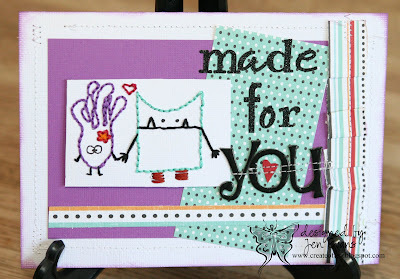 I stamped the image, poked holes with my paper piercer, and stitched away. I haven't done something like this since elementary school! I machine stitched the letters from American Crafts. Create Well: If you do not succeed the first time, try again. 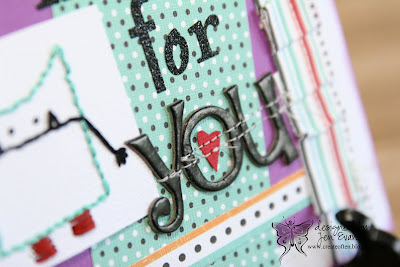 Totally love this card! Love all the stitching and all the attention to detail. You are amazing.